Recently, Dr. Taku, Whitney, Lauren, and Velinka shared a presentation at a Psi Chi hosted event, commemorating Shelby Jane Seyburn, a former PTG lab member who suddenly passed in June of 2017. In attendance were Shelby’s parents, brothers, family and friends as well as many OU faculty and students. The presentation covered Shelby’s research accomplishments during her time with the PTG lab, an overview of the Teen Parent Program that Shelby developed, and the ongoing work taking place in the PTG lab. Dr. Taku began the presentation by sharing Shelby’s early experiences with the lab. She recalled how eager Shelby was to join the lab and start learning about the phenomenon of posttraumatic growth (PTG). Dr. Taku then provided a brief explanation of PTG, explaining that it is defined as the positive psychological changes that can occur through the struggle of traumatic experiences, and clarifying the common misconception that PTG and posttraumatic stress are opposing ends of the same spectrum. She pointed out that the process of growth includes struggle and can be fostered with social support, an area of particular interest to Shelby. Next, Lauren shared how, after identifying her research interests, Shelby devoted much of her time furthering PTG research by studying the role of social support and resilience in predicting personal growth. She was able to do this through psychoeducational high school intervention programs and conference presentations. Lauren showed the audience several of Shelby’s conference presentation posters and the particular findings that propelled each subsequent project. Lauren then explained that Shelby eventually developed a desire to reach out to teen parents after attending a town hall meeting in Pontiac with other PTG lab members, after which the Teen Parent Program began to take shape. Next, Whitney and Velinka gave an overview of the development and implementation of the Teen Parent Program . Whitney first explained the two-pronged purpose the program: to educate teen parents about social support, PTG, and nutrition (another area of interest to Shelby) and to measure the effect of the program on the teen parents. Then, Velinka explained that the first round of sessions was implemented in the fall of 2017, and she provided a session-by-session overview through a brief description of the overarching goal and associated activities of each session. Next, Whitney shared preliminary findings from the first round of sessions and future plans of the program, which includes expansion to other schools, incorporating Shelby’s love for nutrition education, and eventual dissemination of research findings. Lastly, Dr. Taku drew the presentation to a close by sharing the ongoing work in the PTG lab. She noted the unique way each lab member is furthering research of PTG and that Shelby continues to be an inspiration toward that end. The presentation came to close with a special introduction of the foundation created in Shelby’s honor, The Shelby Jane Seyburn Foundation (https://shelbystrong.life). 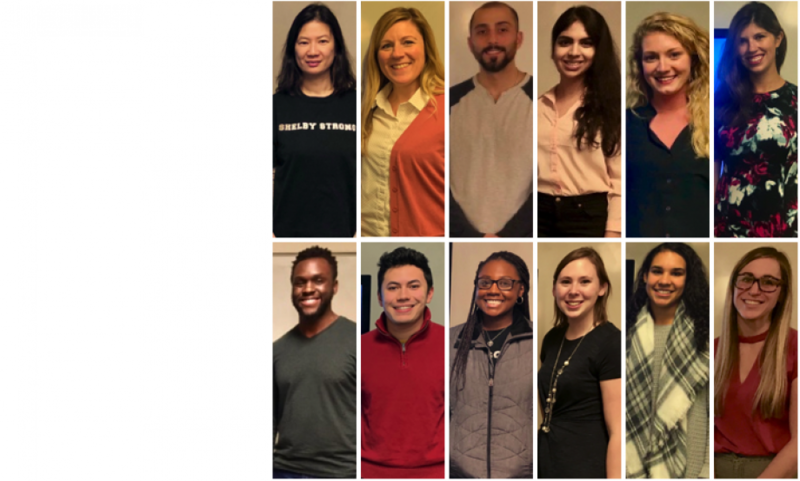 Funds raised will 1) help undergraduate and graduate students attend research conferences which would otherwise require self-funding, 2) help expand the Teen Parent Program, and 3) further the research of PTG and resilience through many avenues. Overall, the commemoration event was a special time to recall and share Shelby’s many accomplishments, highlight the way her research continues to blossom, and to be encouraged by future research of PTG through many different avenues. The PTG lab is incredibly grateful to Psi Chi for hosting the event and to everyone who attended and expressed support and encouragement! Please click the link for more information.